respect to the man in the ice cream van. My theory is that it's best to throw as many surprises at them as possible. Alarms, Clubs, Autolocks, and starter kills seem to be pretty common now, so I wouldn't be surprised if they expect that and know how to defeat those. I even know a guy who was using an Autolock, but that didn't keep his Civic Si from being stolen. He also had a good alarm, which mysteriously stopped working abut 2 days before they took his car. I think it may have had a factory immobliser and/or anti-theft system too. But having many new suprises will waste their time, they may not know why their trick isn't working or how to get around what you've done, and again it wastes their time. The more time they spend, the higher the chances are that someone's going to see them or that they'll give up on your car (but don't be surprised if they come back later for another attempt). I do know for a fact that disabling the power unlock switches can be useful. They used that trick to get into Boarder2's GS-R when it was stolen, and they forgot their tool (a specially bent coat hanger) in his car when they dumped it, so I know that's how they got in. They were obviously professionals, and it looks very much like it was the people who stole b18cya's car just Sunday night. I'm not saying they don't have other tricks, but this is how they've been getting into cars around here. The simple and free solution is to just cut the power unlock wire at the switch. That way you still have power locking (just manual unlocking when inside), it doesn't interfere with your keyless entry, it doesn't look ghetto, and theives will waste their time trying to unlock the car that way. Or, if you want to be clever and have fully functional power locks, you can use two relays to disable the unlock wires only when the alarm is armed (or by a manual switch, if you want). But that's the more complicated solution and it isn't for people who aren't familiar with wiring and relays. the other day i woke up to find a bent up clothes hanger on side of my car, and a few scratches on the hood. tommorrow i will do both of these things now that i finally realize it COULD happen to me. nomatter where you live or who you are it could happen to you, there has never been a car stolen in my town that i know of, it was very surprising that someone would try and break into my car in my own front yard, but it happened. let's say i splice into the wire at the fuel pump and put a toggle switch in a secret but sorta close location in the car, what gauge wire would i want to use and toggle switch? would this draw too much current or is this a safe setup? i don't know much about wiring, but i do know how to splice and cut, i may be able to get a solder too, any recommendations for install? pm me or email me if you have anything secret or really good to tell me or suggest, thanks, i want to do this sat night or sunday. I will eventually get an alarm as well, but i do not want remote start. 16 gauge speaker wire works well. I say speaker wire because 1) it's stranded for sure 2) the two wires are stuck together. but would it work on that part, like if i spliced right from the pump like in the pics? and could i use a lower gauge? like 12 gauge, which i have extra of, or no? or possibly 16 gauge remote wire? What if u know nothing about wiring at all? Iz this still an easy task (relocating hood switch). My teg waz already stolen once and i have a DEI sidewinder w/ kill/starter interupt and it haz some kind of a vehicle recovery system (VRS) should i alwayz activate the VRS? And i waz also thinking about getting one of those alarms w/ a pager that alerts u on what's going on everytime it's triggered. I also block my car in at night. What if u know nothing about wiring at all? Iz this still an easy task (relocating hood switch). 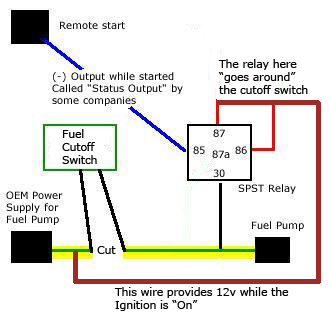 so is it ok to interrupt the power wire at the pump with like 12 gauge wire and a toggle switch without worry of drawing too much current? i don't want to f anything up there, i did my whole sub install myself, no probs, so i think i can handle the wiring, but i am a little more hesitant here. what would be a good length to run off, under a few feet? thanks for any help. but it won't cause any problems with the flow if i have all this extra wire in there and the fuel pump? i hope i have the right idea here, cuz i am going to try it tomorrow.